A definition can be done by the relationship of the forms of work. Here, a portfolio between work place and workstation will be created. The multi-machine operation referred to the two characteristics: multi place single work and multi place group work. 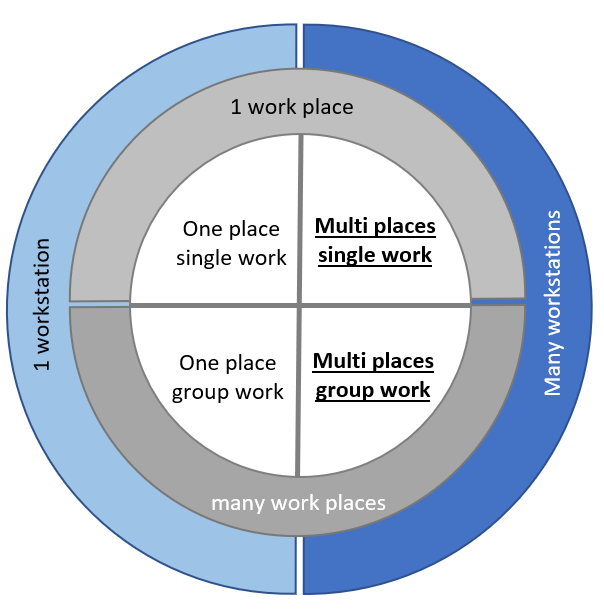 Common forms are: operate 2 machines by one worker and group work, for example, two workers on 3 machines. The potential of a multi-machine operation is mainly caused by a reduced waiting time of workers. As a result, the workload increases and production overheads decreases. Subsequently the machine costs per hour are going down. Is a multi-machine operation working, it is possible to save of 20% of your working costs per hour (depending on the amount of labor costs in your machine costs per hour). In order to get this potential, there have to be fulfilled several conditions. The multi-machine operation is true multitasking. Single or multiple automated processes occur in a time superimposed. This requires a higher qualification of employees. In the above example, the two workers have to master all three machines in full. The affected workers are best integrated from the beginning of the project. By misunderstanding and lack of communication, the project can easily fail. The machining process of a component has to have a very high stability – without any interference. An NC program has to be created robust enough to tolerate material variations without interruptions. E. g. frequent tool changes has to be reduced by sister-tools. The activity and machining processes are clearly known to the workers. There are standards available. For example, the components are to be processed in appropriate product carriers according to lean principles. Transport and clamping devices are adapted to the range of parts. In a multi-machine environment, the parallel processes repeatedly create conditions in which workers must decide what to do next. This always influences the performance of the entire system. In order not to transfer the entire responsibility to the workers, clear rules and understanding should be agreed here, because an unfavorable decision must always be made. E. g.: What is better? Unload machine 1 or load machine 2? It is best, if all observations or measurements are reduced to a minimum and a defined time in the process. Observations or measurements greatly reduce the possibilities of a multi-machine operation, if they can’t be time planned (e. g. measuring tasks). But even if these requirements are fulfilled, it is still not clear whether the parts you produce are all suitable for a multi-machine operation. More certainty is reached by a calculation of the required capacity of worker and machines. There are two possibilities. The more accurate is a practical test. Perform a multi-machine operation directly in your production and monitor the results. This can be useful if you haven’t to rearrange the machine or workplace layout. The second option is a process simulation. In this case the planned range of parts is simulated virtually. For that you need information about the current state of the parts to be machined. For an initial test data such as setup time, loading time, unloading time and if available at all parallel activities in addition to the processing time are suitable. Each line in the figure below contains the time share of a product or component. But a time calculation can not be generic. It always dependents on the production sequence of the products. Looking at the simpler case of multi-machine operation (1 employee / 2 machines) the condition data and the production sequence for both machines are required. Then comes the tedious part of the process simulation: Enter the individual time elements in a time chart. To do this, use the procedure in the above diagram as a rule. Now you do virtually the process the worker would do real. With the analysis of your time chart, you can quite easily see if your range of parts is now suitable for a multi-machine operation and where the problems are. Unfortunately, the creation of the timing charts is very complex. And since the order may have a significant impact, simulate several production days best. How this works without much manual effort, you can read in a few weeks in the next article. Vorheriger BeitragMaterial flow can be easy!